Craving chicken pad thai without all the calories? 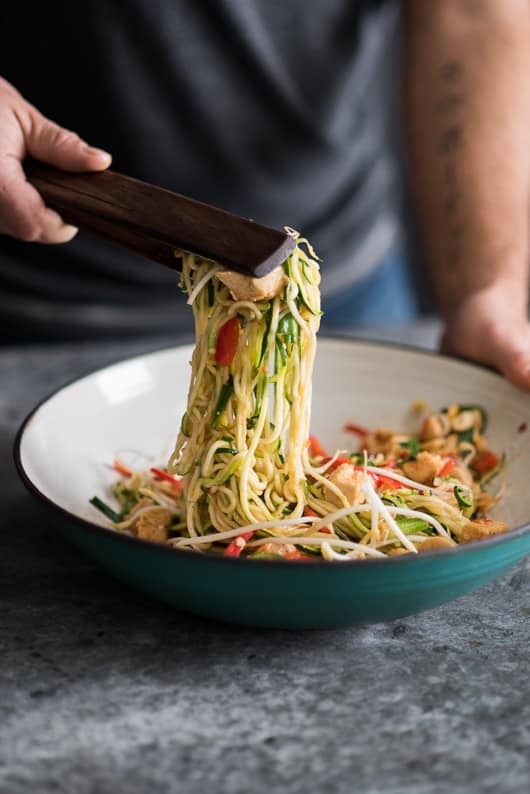 Low carb chicken zucchini noodle pad thai is a reader favorite. Last week was busy, creative and satisfying. After a long dry spell from teaching our natural light food photography workshops, we finally taught again and it was exhilarating. To be around such passionate and food-crazy people for two days really was energizing. It’s not often that you can get together with a small group of folks that share the exact same interest as you and who get just as excited when you find a beautiful sprig of cilantro! 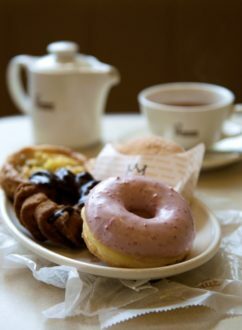 Yeah, obsessive food photography can do that to ya and it’s re-freshing to be able to teach more of our madness. 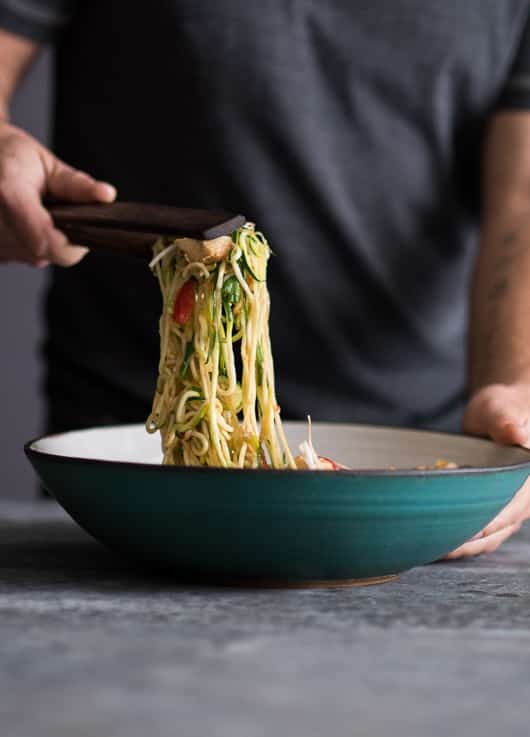 Because it was such a busy week, we turned to some leftover ingredients we had at the studio after the workshop and we automatically thought of zucchini noodles again. 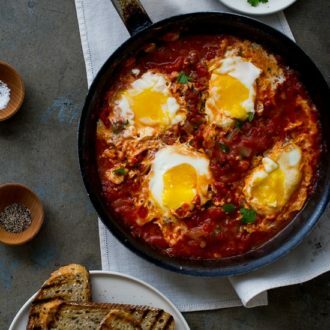 We were craving something light, flavorful and quick. 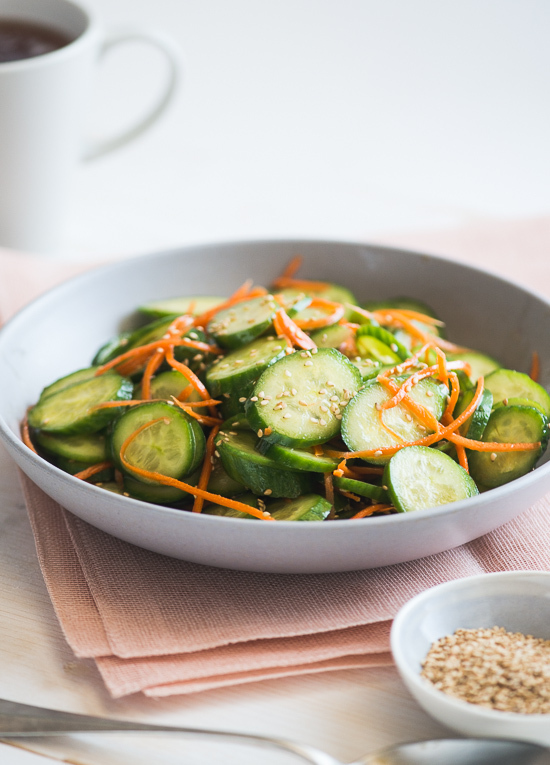 Salads are usually our go-to, but when you’re wanting to really bite and chew into something substantial that was healthier, salads can often get a little boring. 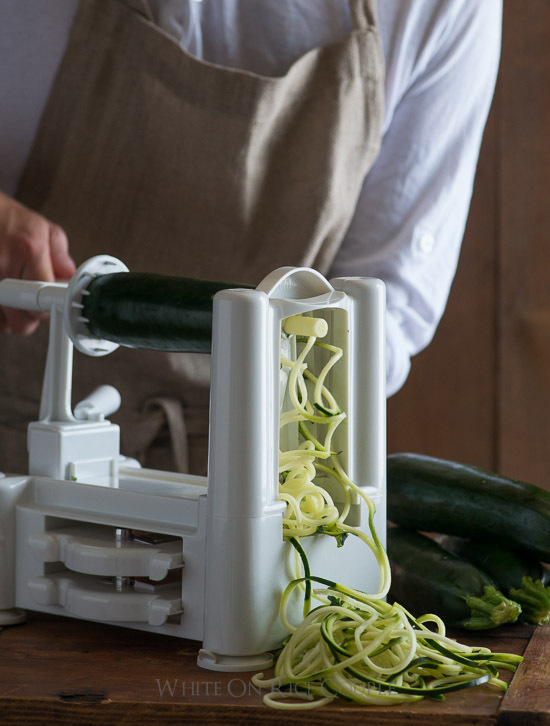 Making zucchini noodle pad thai, one of our most popular blog recipes, was a no-brainer. 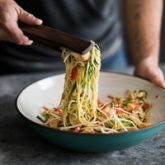 This chicken zucchini noodle pad thai was an automatic dinner idea because adding chicken was definitely a no-brainer adaptation to the original recipe. This time, we just added chicken instead of shrimp and it was fantastic. Voila, chicken zucchini noodle pad thai was created! As many times as we’ve made this, we don’t ever get tired of it. And best of all, we can always make adjustments for it and each bite tastes like a brand new dish. 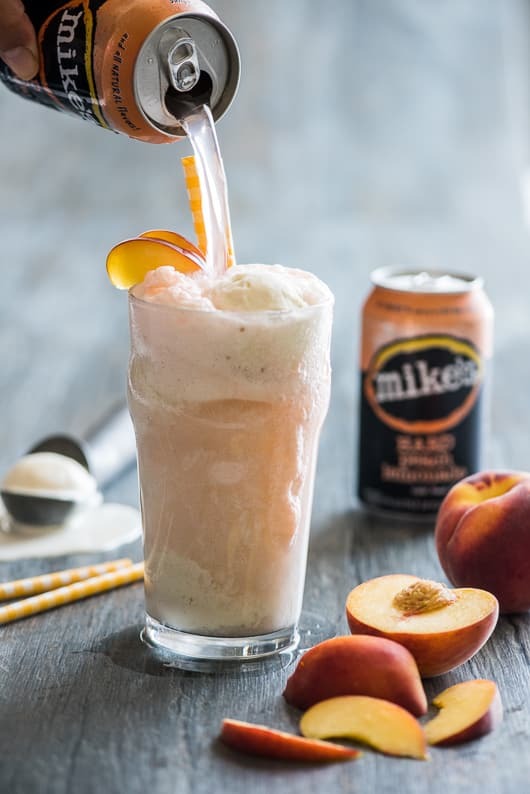 With all the heat this week, we’ll be craving more healthy foods. On top of our list is going to be all of our garden heirloom tomatoes. 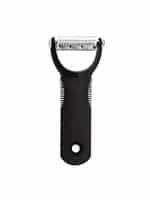 Stay tuned for all our Summer tomato recipes. We’re obsessed with heirlooms! Our original zucchini pad thai recipe. When we first made this version with shrimp, we couldn’t believe how satisfied we were when we were craving pad thai and didn’t even miss the rice noodles. 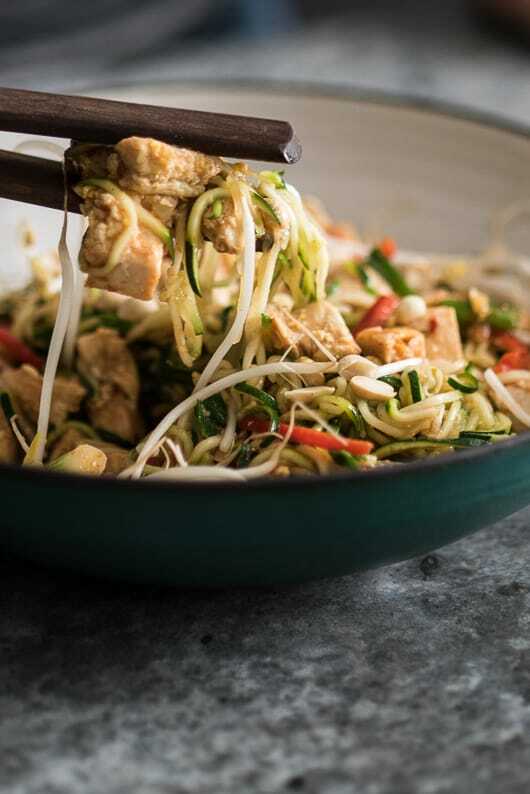 Since then, we’ve adapted our popular Pad Thai zucchini noodles with healthy chicken breast and it’s become an instant hit with friends. Another quick option would be to use shredded roast chicken. Just add it in place of the raw chicken and just cook it long enough to heat-through. 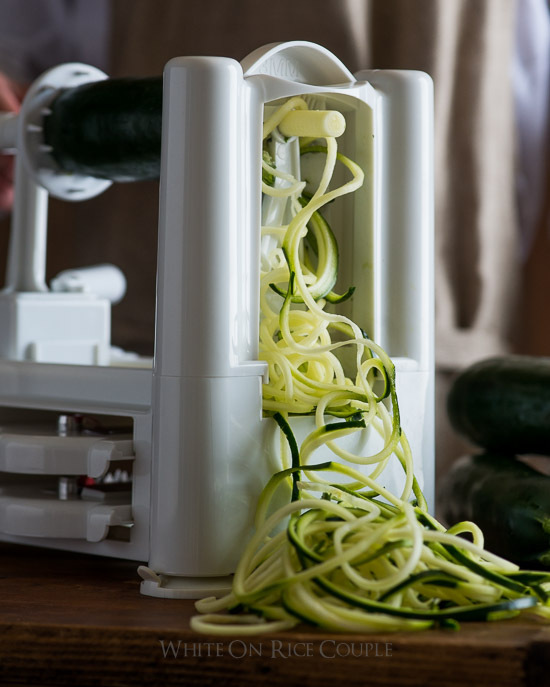 Our favorite tool for making zucchini noodles is the Paderno Spiralizer. Make the Sauce: in a small bowl, combine the sauce ingredients (rice vinegar, fish sauce, ketchup, brown sugar, cayenne pepper, and chili garlic sauce), set aside. If you want to use sriracha hot sauce, add as much as you like or you can add it afterwards. 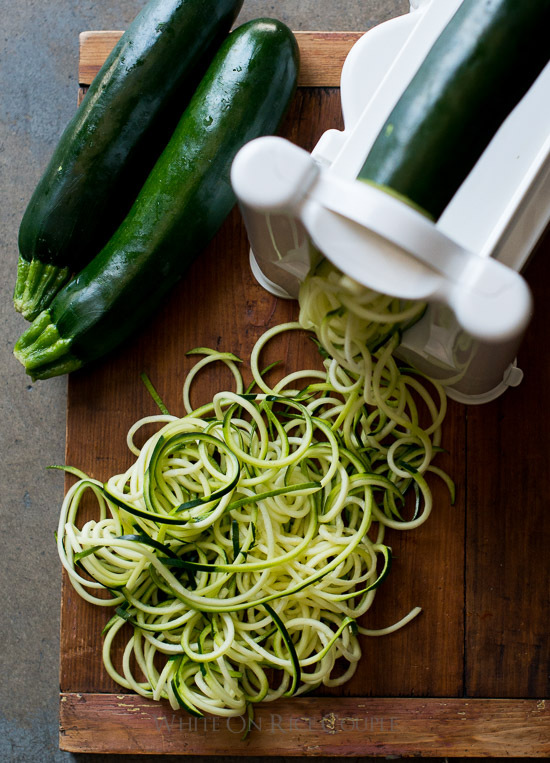 Cut the zucchini into noodles or long pasta by using a vegetable spiralizer tool or similar tool. Heat a large pan on medium-high heat. Add one tablespoon of olive oil (reserve the other half for later). Then add zucchini noodles and cook for about 2-3 minutes or until the zucchini noodles are tender. Don't overcook the noodles. 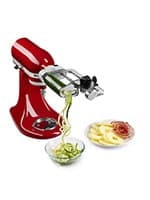 The zucchini noodles should be slightly crunchy with a tender bite. Let the noodles rest for about 3 minutes to allow all the moisture to release. Remove the noodles from the pan and drain the excess water. Carefully wipe the same pan remove the excess water, and then re-heat the pan on medium-high heat. Add the remaining olive oil and garlic. Cook the garlic until soft and translucent, about 1 minute. Add the chicken and cook for about 3-4 minutes, or until tender. Add the zucchini noodles back into the same pan, and then add the sauce. Cook for about 1 more minute or until the zucchini noodles are heated through. Then stir in the bean sprouts. Serve the warm zucchini pad Thai noodles with roasted peanuts and cilantro. If you want to add lime wedges, squeeze some fresh lime juice on the noodles right before serving. 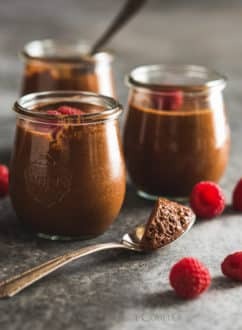 This is a very tasty recipe despite it being low carb! 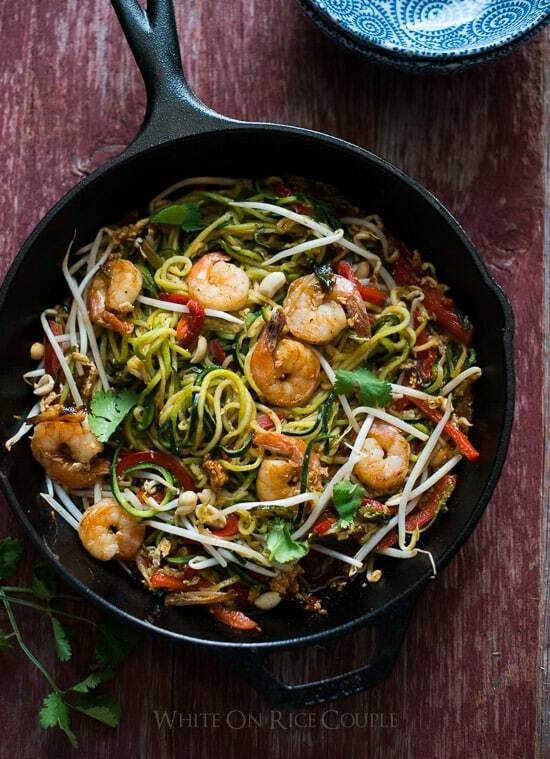 You get the same great Pad Thai taste without all the carbs from the noodles. Great and easy for date nights with the hubby. Thanks for this wonderful recipe! Awesome it’s always a success for date night! Looks like a very easy recipe to prep. I love 30 minute meals as it fits for my busy lifestyle. Will give a try in the weekend. Thanks! I made this for dinner but left out the chicken, wonderful vegetarian dish. 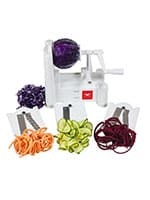 Love the zucchini noodles, I have the exact same spiral cutter just collecting dust. Glad to get some use out of it, won’t be dusty anymore. Colorful dinners are so much more fun to eat! This one looks great! This is just amazing! I made it yesterday and both my boyfriend and I loved it! I made this tonight – delicious!